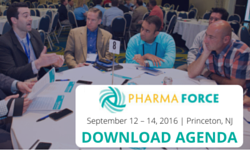 PharmaForce is the only event that brings together marketing and sales leaders for shared insight, conversation and inspiration. Through case studies, group discussions, and networking activities, you will learn the latest best practices, innovations and build lasting relationships. It’s also the only event with a 2:1 pharma/vendor ratio!